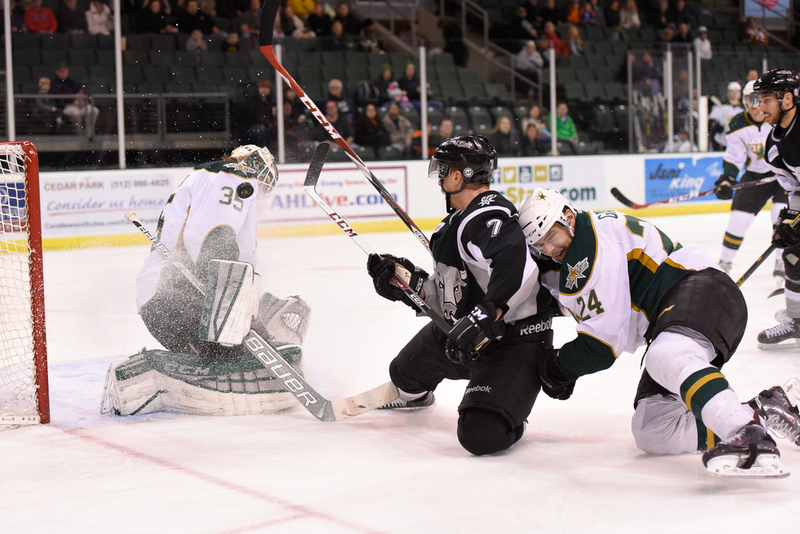 The Texas Stars played the San Antonio Rampage last Tuesday night and I just realized that I'd forgotten to do a 3 shots post. Maybe I was just trying to forget this game. The Rampage has given the Stars fits all season and they got us again on our home ice. The game went all the way to a shoot out in this disappointing loss. Goalie Anders Lindback was down from Dallas to defend the net for this one. He certainly wasn't happy with the loss, smashing his stick against the boards as he left the ice. The first shot shows Maxime Fortunus taking down an attacking Rampage player. The Rampage are a very physical team and our guys seem to have learned to respond in kind. The second shot is of a shot toward our net that was flying high and a Rampage player is reaching out to knock the puck down. The puck can be seen in flight just above Lindback's head. The third shot is a hard drive to the net that was deflected by Lindback as defenseman Guance takes out his man.